UrbanIndo, an online real estate marketplace in Indonesia, announced today that it has raised Series A funding. The financing was led by GREE Ventures, Inc. and includes participation from new investors IMJ FENOX PTE. LTD and a prominent Asian entrepreneur. Early investors include East Ventures and several Angels from Silicon Valley, USA. 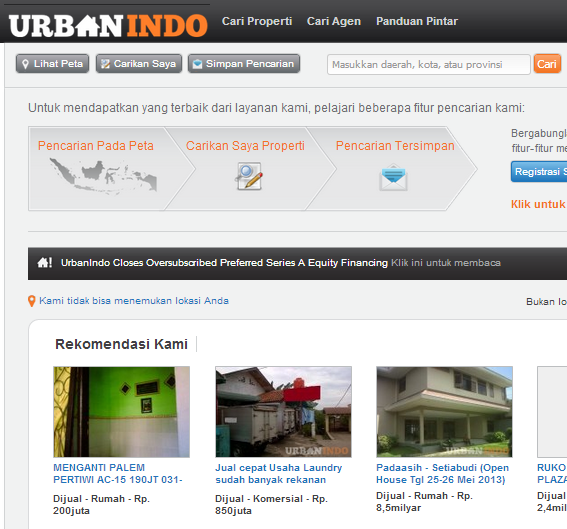 Launched in November 2011, UrbanIndo is the most innovative real estate search in Indonesia. UrbanIndo simplifies the search process by allowing its users to query directly on a map, complete with innovative functionalities such as neighborhood reports, similar properties and price distribution analysis of a neighborhood within a specific listing. “Since its founding, UrbanIndo has experienced rapid growth. The online real estate marketplace in Indonesia is shifting as users rely more and more on market data and tools to make the right decision in buying, renting or selling properties. UrbanIndo is the only online real estate marketplace in Indonesia to combine thousands of property listings with up-to-date market data and local information at the users’ fingertips. This means that virtually all the guesswork is eliminated when making the next real estate endeavor.” says Arip Tirta, Co-founder and CEO of UrbanIndo. Bandung based UrbanIndo currently has 11 employees and plans to use the proceeds from the Preferred Series A to further accelerate its rapid growth, bolster its management team and pursue strategic partnerships. UrbanIndo has demonstrated the ability to work effectively and efficiently in a complex industry by helping its users make the most informed real estate decisions as well as providing real-estate professionals with highly effective and targeted lead gens. UrbanIndo is a leading online real estate marketplace to help homeowners, buyers, sellers, renters, property agents and landlords find and share information about real estate in Indonesia. Launched in November 2011, the company empowers its users with the tools and resources to make smart property decisions. It’s the only online real estate marketplace in Indonesia to combine thousands of property listings with market data and local information. GREE Ventures, Inc. makes Series A investments in start-up companies that have the potential to play an active regional role in East Asia and Southeast Asia. Staffed by experienced professionals with offices in Singapore and Tokyo, GREE Ventures, Inc. provides strategic partnership and mentoring to young start-up companies. GREE Ventures, Inc. is the venture capital arm of GREE, Inc. (TSE:3632), a global mobile social company. IMJ Fenox Pte. Ltd (IMJ Fenox) has been jointly established by IMJ Corporation, a leading web and mobile solutions provider in Japan, and Fenox VC, global investor headquartered in Silicon Valley. The new establishment will invest in mobile, Internet, and software technologies globally with a focus on Southeast Asia, Japan and the United States. Fenox VC’s global network and IMJ’s domain expertise in digital services will help startups penetrate the global market.